Upon my arrival in India, I was greeted by an important Hindu holiday, Ganesh Chaturthi, which celebrates the birth of Lord Ganesha. The elephant-headed god appears on every street corner in Tamil Nadu, the state that I have been exploring. Not only are representations of this Hindu deity abundant, but he is also seen in a variety of different forms. When entering shopping stores, there is often a small Ganesha statue at the front door. Paintings and posters of the deity can be found on many buildings. It is quite obvious from my stay in India that Lord Ganesha has many devout worshippers. Although I arrived in India when the Ganesh Chaturthi festival was occurring, I still wonder why and how this Hindu deity has gained so much popularity not only in India but also worldwide. Despite there not being one specific answer to this multi-layered question, a combination of Ganesha’s unique iconography, commercialization and his ability to overcome obstacles all contribute to his fame. 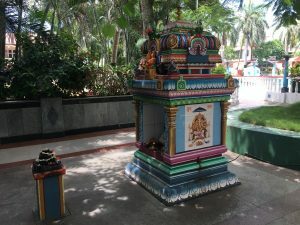 A small Ganesha shrine at the beach resort in Mahabalipuram. How did Lord Ganesha obtain his elephant head? Was he born with it? There are a wide range of explanations concerning the origin of the elephant head, but the most frequent story told actually describes Ganesha being born with a human head. Ganesha is the son of Lord Shiva and his spouse, Parvati. The popular storyline begins with Shiva leaving to practice meditation on Mount Kailasa. Shiva was gone for a long period of time and Parvati was left alone. Her loneliness eventually prompted her desire to have a child, so she gave birth to Ganesha. Ganesha acted as a protector for his mother, and when Shiva returned from his meditation, Ganesha forbid Shiva from seeing Parvati. This ultimately resulted in a vicious fight, and Shiva decapitated Ganesha. Parvati demanded that Shiva fix this problem immediately, so the servants brought back a chopped elephant head and placed it on Ganesha’s shoulders. However, other stories about Ganesha’s birth claim that he was born with the elephant head. The basic features of most Ganesha statues include red or pink coloring of the body, four hands that usually hold an object and a golden crown placed on his head. Each detail in the sculpture has significance. The direction of the trunk, the type of posture and the objects in his hands all influence the meaning of each sculpture. A few examples of the different objects that have been seen with Ganesha are broken tusks, weapons, sugarcanes, modaks and lotuses. Commonly seen held in Ganesha’s hand is the broken tusk. By carefully observing Ganesha’s face, one will notice that he is uni-tusked. The of cause of the singular tusk varies in the Puranic legends. According to the Shiva Purana, when the servants were searching for a head replacement for Ganesha, they just happened to bring back an elephant head with only one tusk. Another important object carried is the pasha, an instrument believed to tame unwanted desires. At some of the shopping stores that I’ve visited, there are also many statues and paintings that portray him as an adorable child. His small stature and chubby body make him appear younger in comparison to the other gods. People have a tendency to be drawn to objects that stand out, and Ganesha’s uniqueness definitely appeals to the masses. A picture from a Ganesh Chaturthi festival. There are also economic incentives for publicizing Lord Ganesha. 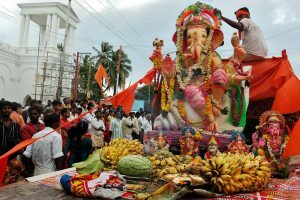 Indian festivals, such as Ganesh Chaturthi, provide a source of revenue for the country. Festivals attract people from within the country and all over the world. Crowded areas provide plenty of opportunity for street sellers to make more money. Artists have reported that the demand for Ganesha statues have dramatically increased, especially in the last 20 years. Although the expensive cost of granite rock, which is used to make some statues, still presents a problem for these artists, many are still able to make a profit from the famous Hindu deity. Since Ganesha is so easily identifiable and catches the eye, his features make him perfect for advertisements. Australia just aired an ad with Ganesha in it. In the commercial, Lord Ganesha along with other religious figures are sitting around a dining table. As the ad ends, the viewer realizes that the main purpose is to promote the eating of lamb. Many Hindus felt insulted by the advertisement because of their religious beliefs, which discourages meat consumption. The Indian government is currently pushing for the removal of this advertisement. Besides the controversy that the advertisement has generated, it not only demonstrates how highly Ganesha is regarded by Hindus but also shows how the deity was used to make money by the meat industry that sponsored the ad. The Arulmigu Manakula Vinayagar Temple in Pondicherry. Known as the “Lord of Obstacles,” Ganesha has the power to eliminate hurdles in people’s lives. Rich or poor, everyone faces challenges in life. Lord Ganesha represents the life struggle to which all humans can relate. Because he is relatable, Lord Ganesha has a unifying power that brings Hindus from all backgrounds together. Whether it’s taking an important test or applying for a new job, people pray to Lord Ganesha in hope that he will ease their conflicts. While Ganesha has the ability to rid people of their problems, he can also be the creator of those obstacles in life. While Lord Ganesha may provide financial support to many artists, the paints used in creating the god contain lead and other heavy metals. At the end of the Ganesh Chaturthi festival, idols of Ganesha are dumped into the rivers. Artists are being pressured by the public to make the idols, such as Lord Ganesha, more vibrant and multicolored. Also, some artists may disregard the environmental damages for some instant cash. However, the contaminated water from this practice has caused environmental and health issues in India. Also, in some cases, temples can be transformed from places of worship into businesses. At the Arulmigu Manakula Vinayagar Temple, I saw several street sellers and shops directly in front of the temple. Elephant blessings are offered here, and I was in total shock to see an actual elephant there. While I cannot comment on the treatment of the elephant or how the money is spent that is given to the elephant, there is definitely a business associated with the temple. Also, as seen with the Australian commercial, misuses of Lord Ganesha in the media can be disrespectful to Hindus. Thus, let Ganesha’s popularity not be twisted into greed and ignorance, but as a way to inform others about the Hindu religious tradition.